Call 8444 7320 for a great deal today! 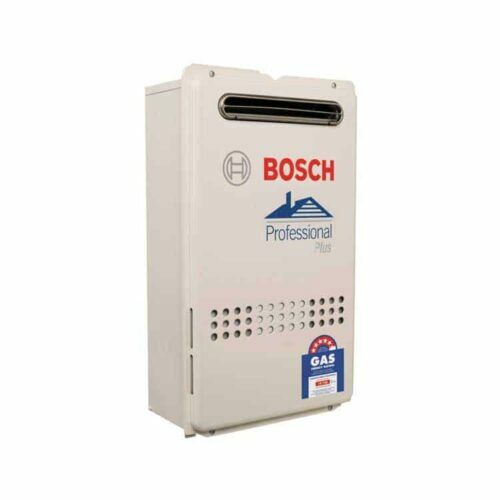 SA Hot Water™ sells the complete range of Bosch Hot water systems at the best prices in Adelaide. Bosch has redefined hot water systems with the Bosch OptiFlow, the first water heater with Bluetooth connectivity on the Australian market. Models are available in 16, 20 and 26 litre per minute flow rates. Bluetooth connectivity offers several benefits. A free app for users allows them to track usage statistics, as well as serving as an additional thermostat, while a free app for plumbers allows them to remotely adjust settings and run diagnostics, making installation more time- and cost-effective. 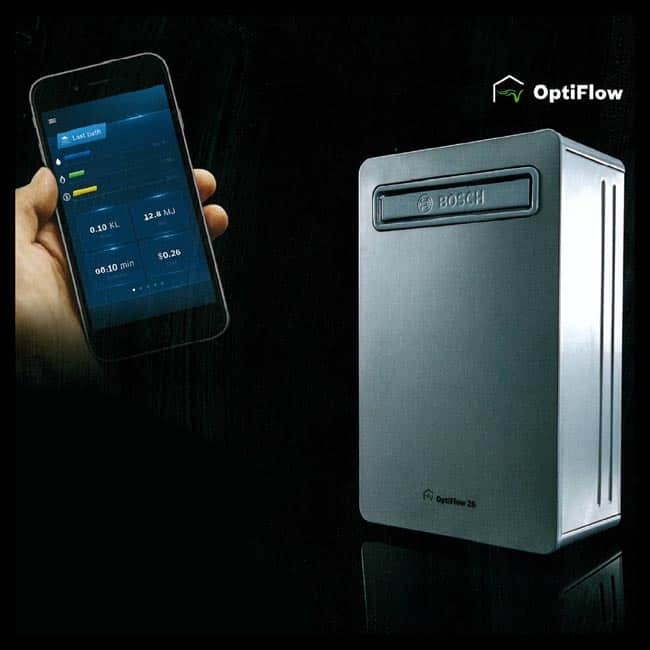 In addition to its Bluetooth connectivity, the OptiFlow also utilises the patented Bosch OptiFlow algorithm, which continuously adapts the system’s gas-air ratio throughout its lifetime, ensuring optimum performance and effectiveness. 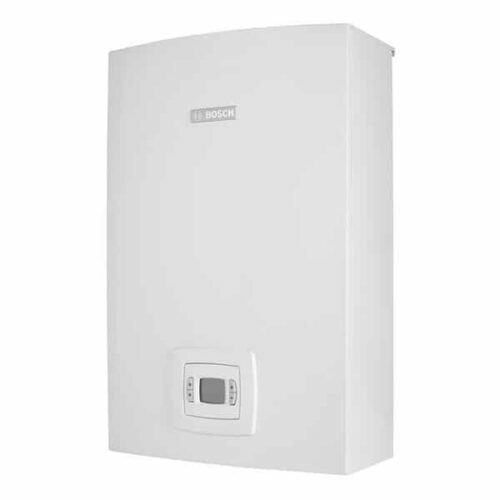 This water heater also utilises Bosch’s patented “Easy Minimum” technology for maximum comfort, and its elegant design makes it a true architectural feature. 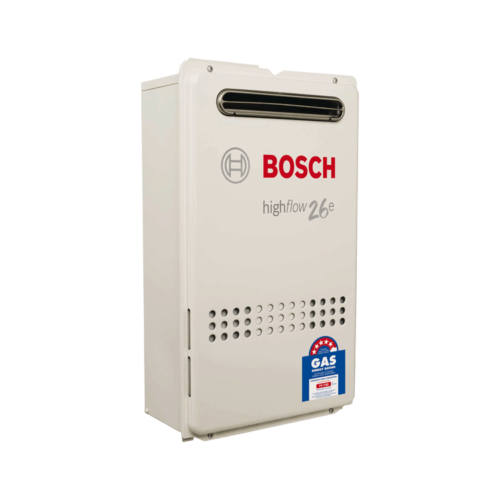 Bosch’s OptiFlow combustion management system utilizes a patented algorithm to modulate the appliance gas valve and fan speed to ensure optimum combustion. 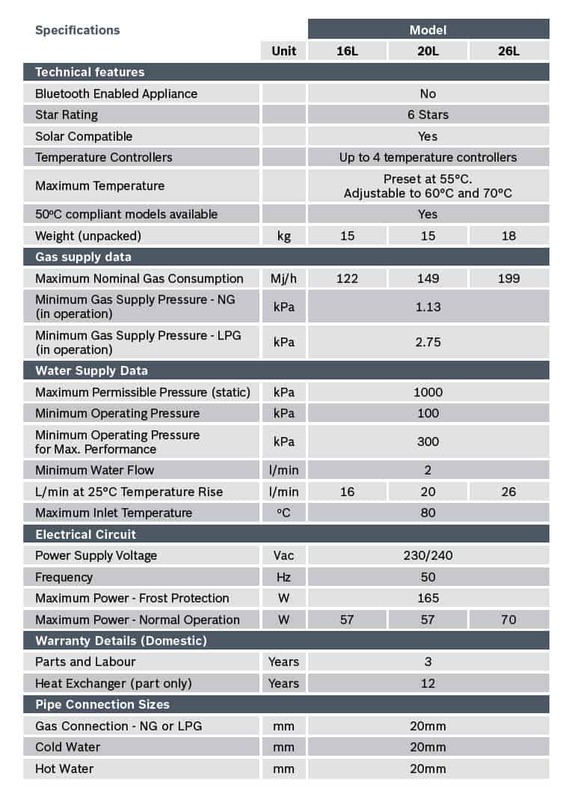 The gas to air ratio is measured 4 times per second, and if necessary adjusted. 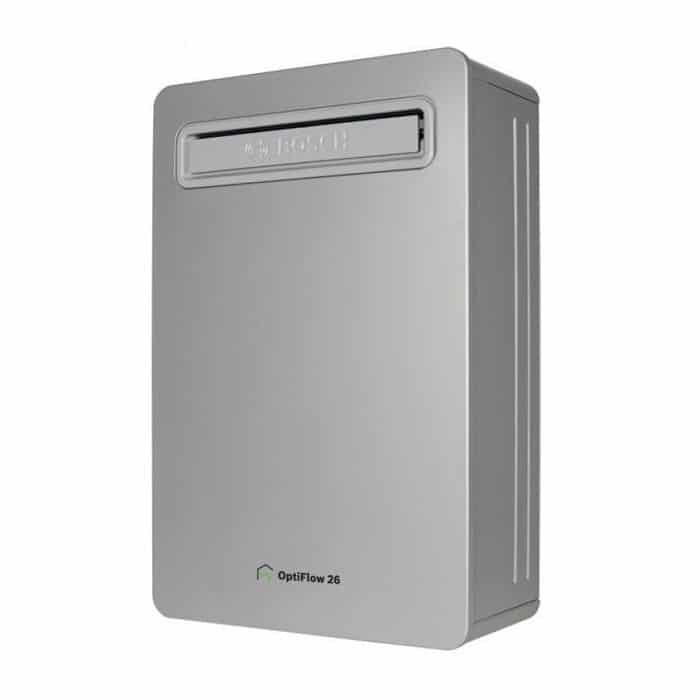 This process is ongoing over the lifetime of the appliance, allowing it to intelligently and continuously adapt to changing environmental conditions, ensuring optimum efficiency in all conditions over the lifetime of the appliance. 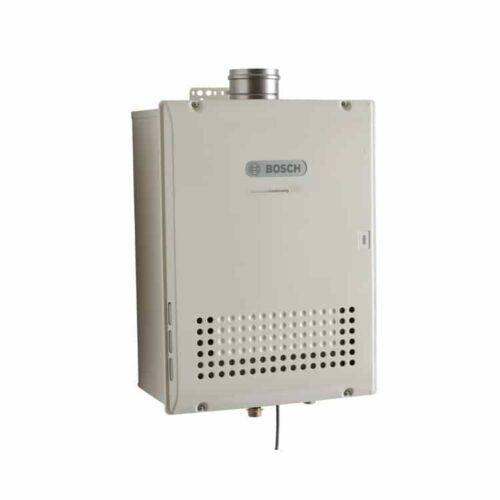 A new patented Bosch technology known as “Easy Minimum” allows the OptiFlow hot water system to operate at very low minimum power output, while maintaining a stable output temperature for more comfortable showers. 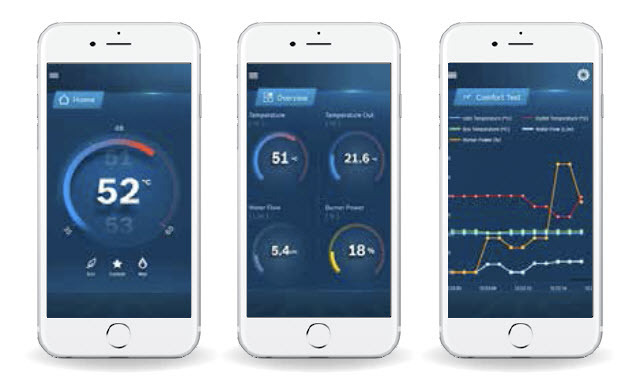 This technology is beneficial in situations where the incoming water temperature is high and only a small temperate rise is needed. 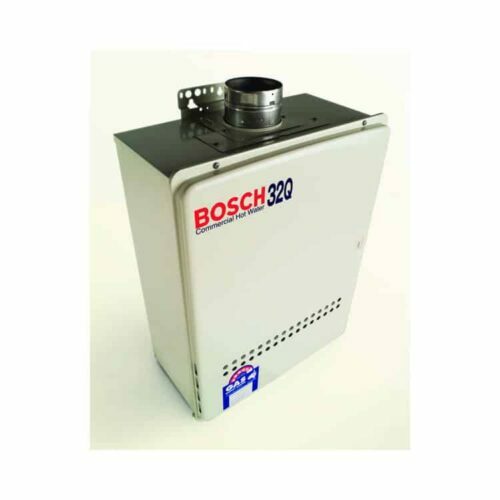 In this situation the appliance burner modulates in conjunction with an active by-pass valve. 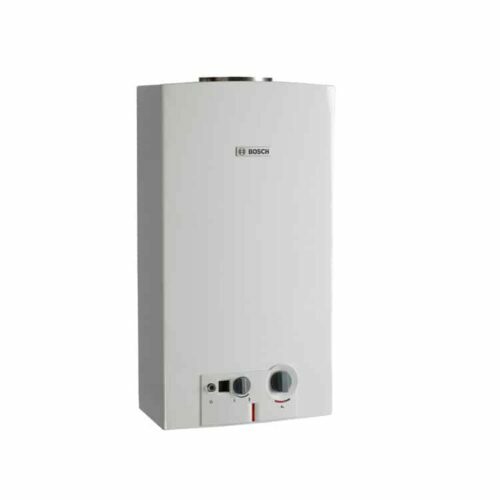 This feature extends the operating range of continuous flow water heater technology. 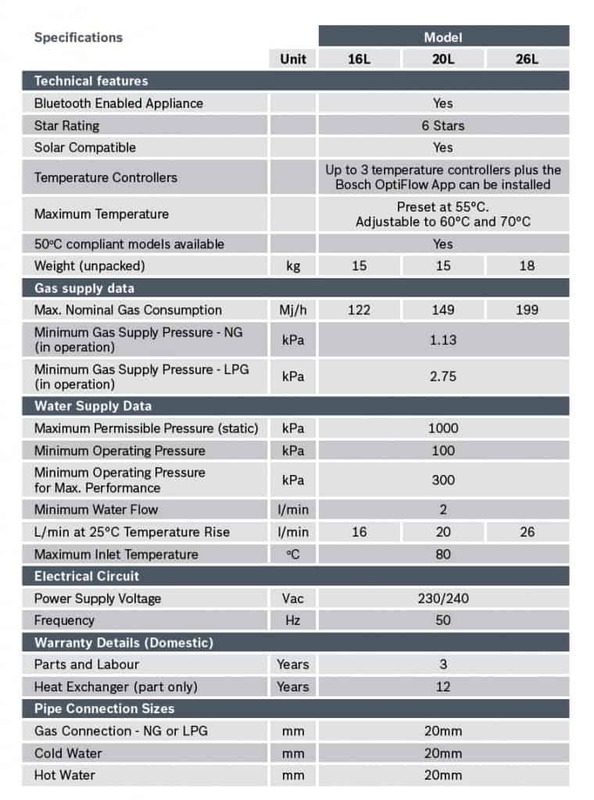 Contact SA Hot Water™ for more information. Bosch Hydropower Gas Hot Water System 16H. 1 bathroom homes /2-3 occupants. The Bosch OptiFlow Professional is a gas-powered, 6 star energy rated continuous flow hot water system which comes in 16L, 20L and 26L varieties. The Professional model is the non-bluetooth enabled version. Also available as the Optiflow Professional Internal, a room selaed appliance for indoor installation. 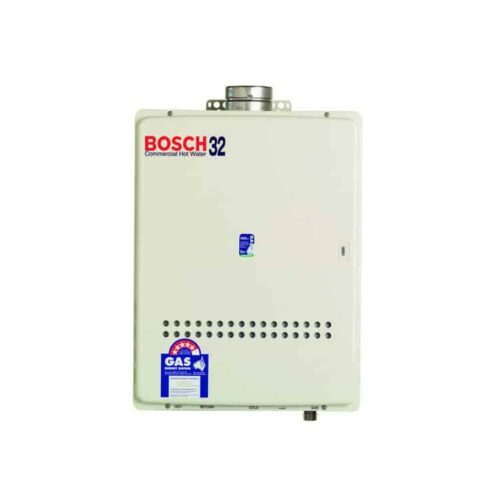 Bosch Internal Compact Hot Water System Ci13. 1 bathroom homes /single occupant. 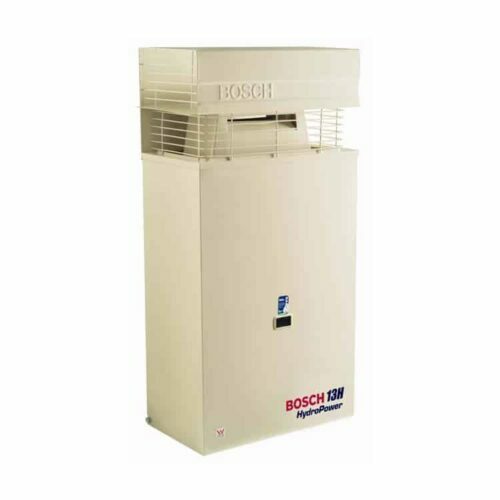 Bosch Commercial Hot Water System 32. 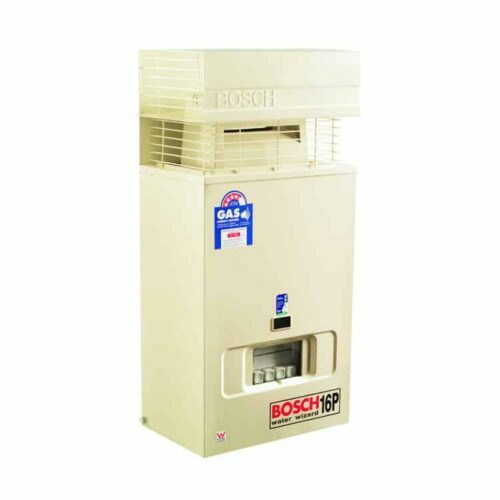 Commercial System. allows installation close to the point of use. Available 12, 16 & 20 litre per minute models. 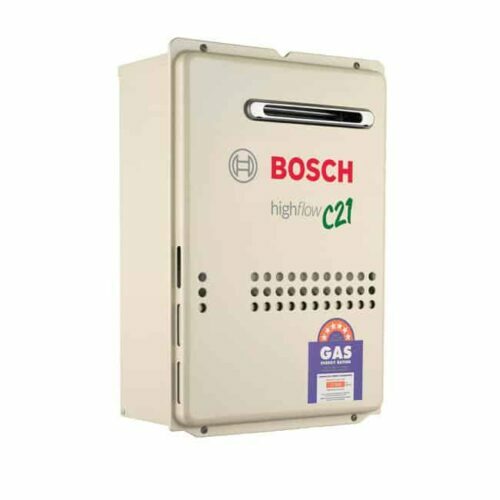 Bosch Pilot Ignition Gas Hot Water System 13H. 1 bathroom homes /1-2 occupants. 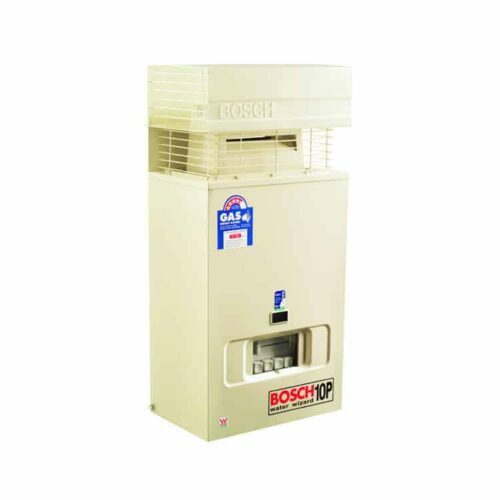 Bosch Professional Hot Water System. 1-2 bathroom homes. 1 bathroom homes /single occupant. 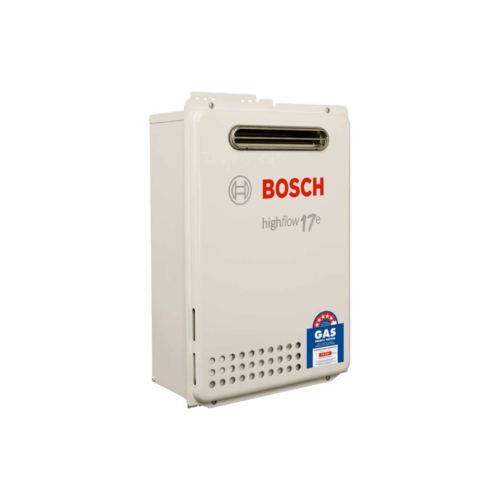 Bosch Hydropower Gas Hot Water System 10H. 1 bathroom homes /single occupant. 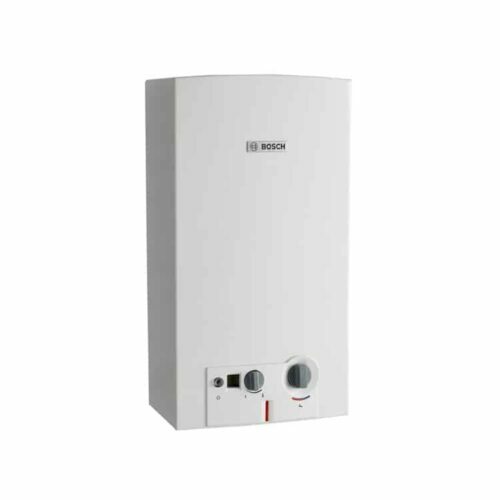 Bosch Internal Compact Hot Water System Ci10. 1 bathroom homes /single occupant. 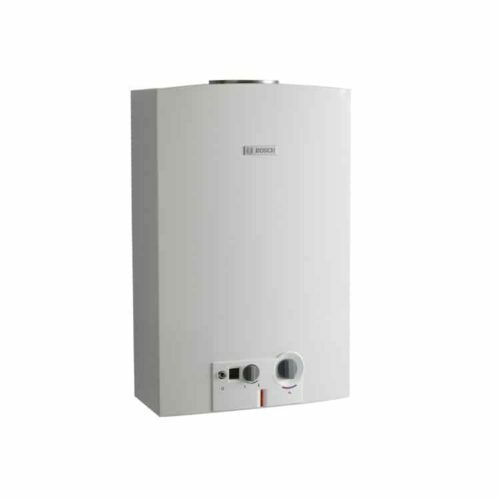 Bosch Internal Compact Hot Water System Ci10. 1-2 bathroom homes. 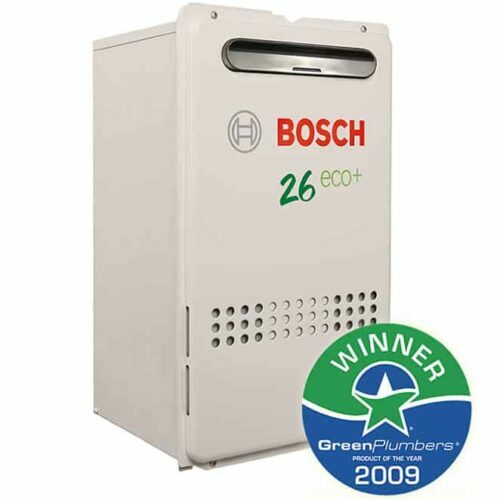 Bosch Range of Instant Gas Systems Best Price!